Councillors Sandy Stuart and Alison Alphonse at the bus terminus near Shielhill Avenue Bridge of Don. Since First Bus withdrew its X40 service Bridge of Don has no direct bus to and from the ARI. Patients have been faced with journeys of more than an hour to get to hospital after a direct bus service to an Aberdeen community was scrapped. The former X40 service picked up residents from the Dubford area of Bridge of Don taking them straight to the city infirmary. But the route ended up being withdrawn on April 1 due due to “consistently low” passenger numbers. 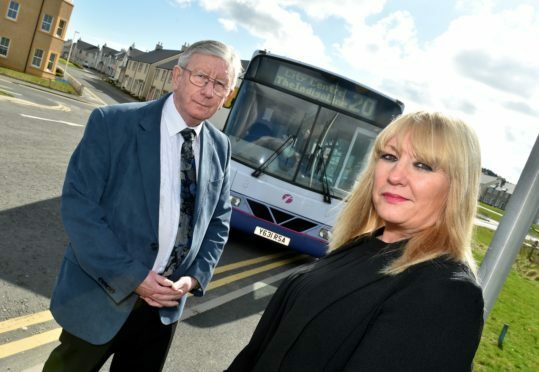 A First Bus spokesman said it was “no longer a commercially viable service”, however, Bridge of Don councillors have now raised concerns about patients relying on public transport being left with much longer journeys. Local SNP councillor Sandy Stuart said: “It’s not just patients that are affected, but also a number of staff who will now have to spend a lot more time and money to work in our NHS. “There are a lot of NHS staff who live on the bus route who are now unsure about how to get to and from work. “The argument that staff would be getting a day ticket anyway doesn’t really hold up for a lot of staff who will be working through the night. However, the bus firm spokesman said that decision to alter services were not taken lightly, adding: “there will be instances where links may be lost and customers will require to split their trip similar to customers from other areas”. He said passengers numbers on sections of the route had been in decline for some time. He said: “The alternative services that now cover these routes are comparable in time to the historic legs of this journey, but we apologise to customers for any inconvenience caused by the changes. “Unfortunately, the regular daytime usage and continued decline of passengers means this is no longer a commercially viable service.